Morris - I Say Ding Dong Shop - Buy Stickers, Decals & Unique Automobilia. 'In Rust We Trust' Union Jack Style Document Holder Bag. A4. Alexander Conversions Yellow & Black Oblong Stickers. 4.5" Pair. Alexander Conversions Yellow & Black Oblong Window Sticker. 4.5". Another Quality First Morris Window Sticker. 17.75". Austin Mini 1100 etc BMC Old Style Thick Foil Sticker. 4". Bluemel's Foil Rounded Oblong Stickers. 35mm Pair. BMC Australia Sales & Service Rosette Car Body or Face Stick Window Sticker. 4". BMC Black & Brushed Foil Rosette Sticker. 3". BMC British Motor Corporation Tyre Pressure Stickers. 1.75" Pair. BMC Mini Classic Range of Scrapbooking Stickers Small Scale Labels. Set of 10. #2. BMC Off White Rosette Stickers. 4" or 6" Pair. 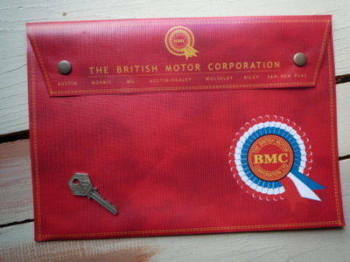 BMC Plain Document Holder. A4. BMC Rosette Document Holder/Toolbag. 10" or A4. BMC Rosette Face Stick Window Sticker. 2" or 4". BMC Seat Belts Lift Style Shaped Stickers. 1" Pair. BMC Shaded Style Rosette Sticker. 8", 10", 12", or 14". BMC Shaded Style Rosette Window Sticker. 4". BMC Small White on Matt Black Rosette Stickers. 2.25" or 2.75" Pair. BMC, James McHarrie, Stranraer, Dealers Sticker. 8.5". Britax 'Lyfe-Lok' Seat Belt Buckle Stickers. 38mm Pair. British Leyland Archers Shirley & Solihull Dealers Window Sticker. 7.5". British Leyland BL Tyre Pressure Stickers. 1.75" Pair. British Leyland Blue & Black ST Silver Stickers. 4" Pair. British Leyland Henlys Dealers Window Sticker. 9". Burgess Air Filter Stickers. 40mm Pair. Clear Hooters Birmngham and Bedworth Oblong Stickers. 70mm Pair. Clear Hooters High & Low Note Horn stickers. 38mm x 12mm Pair. Colmore Depot Dealers Window Sticker. Black & White or Gold & White. 8.5". Cooke Motors Calgary. Morris, MG, Jaguar Dealers Sticker. 4". Coopers Air Filter Sticker. Blue & White or Blue & Silver 4"/100mm. Coopers Air Filter Stickers. Blue & White or Blue & Silver 2" Pair. Desmo Black & Clear Stickers. Set of 4. 30mm. Downton Logo Style Self Adhesive Laser Car Gear Knob Badge. 25mm. Heronsgate of Chorleywood British Leyland Dealers Window Sticker. 11.5". In Rust We Trust Union Jack Shield Style Sticker. Various Colours. 2.75".